NAT: don't exceed the maximum number of "search" suffixes. Patch from bug. NAT: fixed parsing of port-forwarding rules with a name which contains a slash. NAT Network: when the host has only loopback nameserver that cannot be mapped to the guests (e.g. dnsmasq running on 127.0.1.1), make DHCP supply NAT Network DNS proxy as nameserver. Bridged Network: prevent flooding syslog with packet allocation error messages. Snapshots: fixed regression in 5.1.4 for deleting snapshots with several disks. API: fixed initialization of SAS controllers. Windows hosts: adapted to changes in Windows 10 build 14901. Windows installer / Additions: added option to prevent creating of start menu items. Windows Additions: fixed a generic bug which could lead to freezing shared folders. Linux hosts / guests: fix for kernels with CONFIG_CPUMASK_OFFSTACK set. Linux Additions: don't require all virtual consoles be in text mode. This should fix cases when the guest is booted with a graphical boot screen. X11 Additions: disable 3D on the guest if the host does not provide enough capabilities. 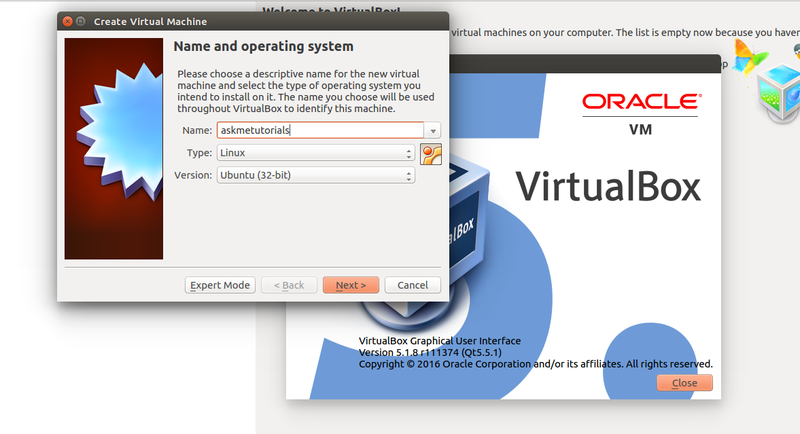 $sh -c "echo 'deb http://download.virtualbox.org/virtualbox/debian '$(lsb_release -cs)' contrib non-free' > /etc/apt/sources.list.d/virtualbox.list"
Note : LinuxMint and elementary OS users have to replace the name manually in place of $(lsb_release -cs). If you are not comfortable with the PPA for installing the Virtualbox ,then manually download the deb file and install it. askmetutorials © 2016-2017. All Rights Reserved.